Chemistry professor Douglas Mitchell was named a 2012 Packard fellow. 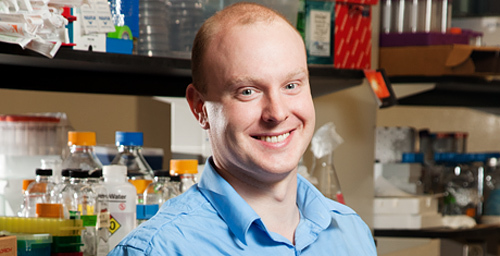 Mitchell's research addresses problems related to antibiotic resistance. CHAMPAIGN, Ill. - University of Illinois chemistry professor Douglas Mitchell has been named a Packard Fellow in science and engineering. He is among 16 early career researchers honored by the David and Lucille Packard Foundation in 2012 for outstanding creative research. Blending chemistry and biology, Mitchell works to understand the molecular roots of what make bacteria infectious, with the goal of addressing antibiotic resistance and exploring new antimicrobial agents. "It has been a true delight watching Doug's program evolve at Illinois," said Jeffrey S. Moore, professor and interim head of the chemistry department. "Given the rapid rise of drug resistance and the threat of a post-antibiotic era, new strategies for suppressing antibiotic resistance must be deployed. Doug's lab is tackling this by developing compounds that are capable of selectively killing pathogens as well as others that don't kill, but rather render the pathogens incapable of causing disease. I'm very excited about the significant role that Doug is likely to have in developing personalized medicines for antibiotics." The Packard fellowship includes an unrestricted five-year, $875,000 award to support research of the recipient's choosing. Mitchell's award will support a new project that aims to develop unconventional methods to manipulate microbial genomes. "Although the approach should work for studying the function of any gene, we are doing this for the purposes of discovering natural products more efficiently," Mitchell said. "Natural products are our most valuable source of all medicines, thus finding new ways to rapidly discover them will be quite useful." Mitchell's group focuses on a particular class of molecules found naturally in bacteria and archaea, called thiazole/oxazole-modified microcins (TOMMs). The group uses chemical and genomic techniques to identify the structure and function of TOMMs and the enzymes that produce them. Then, the researchers can apply that knowledge to develop inhibitors if the TOMM is pathogenic or exploit therapeutic properties if the TOMM is antibiotic. Mitchell earned his doctorate from the University of California, Berkeley, in 2006, then completed a postdoctoral fellowship at the University of California, San Diego, before joining the Illinois faculty in 2009. He also is affiliated with the Institute for Genomic Biology and the department of microbiology at the U. of I. Since its inception in 1988, the Packard Fellowship Program has named 489 fellows, including 13 U. of I. faculty members. Each year, new fellows are chosen from nominations submitted by the presidents of 50 top universities. The Packard Foundation is not the first to recognize Mitchell as one of the most promising young researchers in the U.S., as he received the NIH Director's New Innovator Award in 2011. Editor's note: To contact Douglas Mitchell, call 217-333-1345; email douglasm@illinois.edu.